Before my foray into skin care using a face- mist seemed a bit of an overkill. I mean why spray your face with a liquid if you have just cleansed or have put on moisturiser. However, as my understanding grew so did my appreciation of a good face mist. Mists are useful in helping skin absorb serum or moisturizing ingredients better. When infused with botanicals have additional benefits and can act as hydration boosters. They can be helpful in preparing the skin for moisture as well as rejuvenating your skin on a hot day. Here are the 3 face-mists in my collection which I enjoy use depending on how my skin feels that day. I got a small bottle of this as part of the Caroline Hirons; Cult beauty box about a year ago and have just gotten around to using it. It gives a nice boost to my skin it has no discernible scent so is completely underwhelming as it does not evoke any feelings. 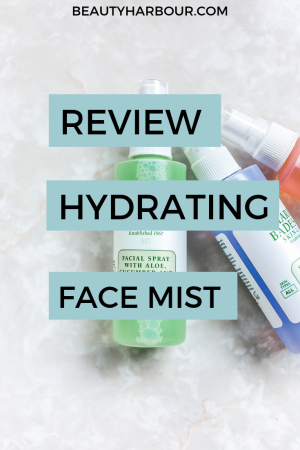 The mist when sprayed is very fine which is perfect so you don’t feel like you are being pummelled by liquid but it certainly provides the promised hydration. This makes it one that can be used during the day to refresh your face because it will not disturb the makeup or products underneath. Although it is reputed to be good for calming acne prone skin I cannot say I have noticed a significant difference. Although it has a quite a following I struggle to see why it is an okay mist and I do not see spending the full amount to buy this on its own. I will use up the bottle I have but certainly will not be purchasing it. This I also got as part of a cult beauty box and boy I am happy I got a bottle. It comes in a 100 ml black May Lindstrom signature bottle with a nozzle which provides a fine mist when sprayed. I can certainly say that this has been great for my skin and provides adequate hydration as promised. The smell of this mist is just out of the world and I would buy it just for that reason alone. Apart from hydration, it provides its combination of ingredients which help in calming oily and acne prone skin like mine. It is fantastic in reducing redness due to the antibacterial properties. I have definitely noticed a reduction in blemishes since adding this to my skincare regimen. My only peeve is the cost, as it is difficult to justify spending so much on a face mist. However, I plan to do just that because it is such a great product and one I plan to repurchase. For me, the clear winner of this group of face mists is the May Lindstrom –the Jasmine Garden and I am cringing as I say this because of how expensive it is. However when you use this product you will understand what I mean, it ticks every single box. The second would be the Gulsha Rosewater spray and the Omorovicza mist is my least favourite of the lot. What mists do you use? Do you think they are worth spending the extra money? or should one just focus on using more effective serums. I love real review like this. I’ll definitely check these products. Thanks for sharing ♥️ ♥️ By any chance you are interested on doing collaborations, you can check out the collaborations portal of Phlanx.com and connect with amazing brands!